This text is wrapped in a box. You can set the location on the page, box width, color, and the type and width of the frame. 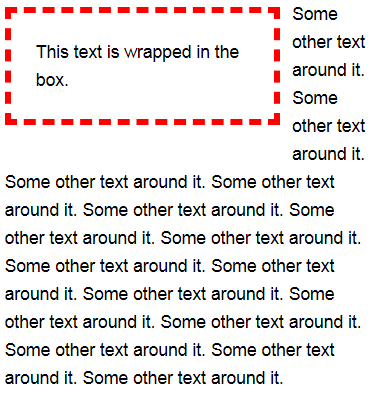 The main text on the page will flow around the box. right – Align to the right margin. left – Align to the left margin. Parameters of the box borders: width in pixels, line type, and line color. This text is wrapped in the box. Some other text around it. Some other text around it. Some other text around it. Some other text around it. Some other text around it. Some other text around it. Some other text around it. Some other text around it. Some other text around it. Some other text around it. Some other text around it. Some other text around it. Some other text around it. Some other text around it. Some other text around it.